Randle is one of 300,000 registered voters in Wisconsin, 9 percent of the electorate, who do not have a government-issued photo ID and could be disenfranchised by the state’s new voter-ID law. Wisconsin has historically ran elections better than almost anywhere in the country… All that changed when Scott Walker and the Republican legislature took over the state in 2011. The voter-ID law is just one of many new voting restrictions passed by Republicans in Wisconsin since 2011. 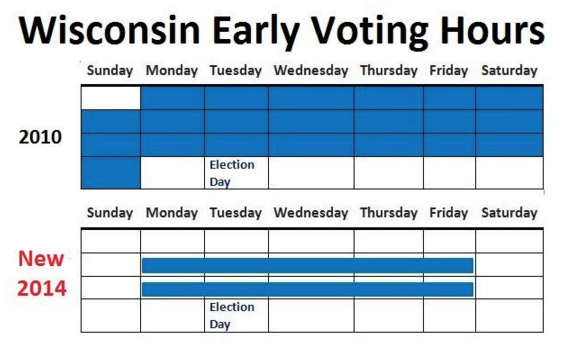 Most notably, the state legislature also eliminated early-voting hours on nights and weekends (GOP State Sen. Glenn Grothman said he wanted to “nip this in the bud” before early voting in cities like Milwaukee and Madison spread to other parts of the state) and made it virtually impossible for grass-roots groups to conduct voter-registration drives. Wisconsin has historically ran elections better than almost anywhere in the country, with consistently high voter turnout and reforms like Election Day registration in place since the 1970s. All that changed when Scott Walker and the Republican legislature took over the state in 2011.